The Edublog Awards were born in 2004 in an attempt to share the great learning and sharing happening in online or social media for education but were being blocked by employers/districts. I feel I need to back this process since, over the past 2 years, I have become a social media enthusiast and it absolutely falls in line with my beliefs about tools to help students and professionals share and learn together across nations, oceans, and disciplines. This is my first time nominating anyone for Edublog awards, but I feel I’ve been in the online community long enough now to finally have a good idea of what I really like and have learned from. There are many I wanted to also nominate, but had to make some difficult decisions. There’s always next year, right? 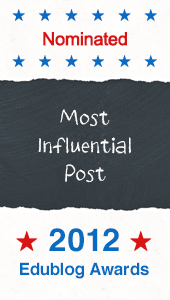 Best individual blog: SpeechTechie.com, who won best new blog in 2010, has continued to share great content in regular blog posts throughout 2011. Sean‘s posts hold a wealth of knowledge that can be applied to teachers or SLPs alike and applies web and tech based resources to curriculum and language development in a creative way. I love how he merges curriculum and language development and helps us all to see the overlap. 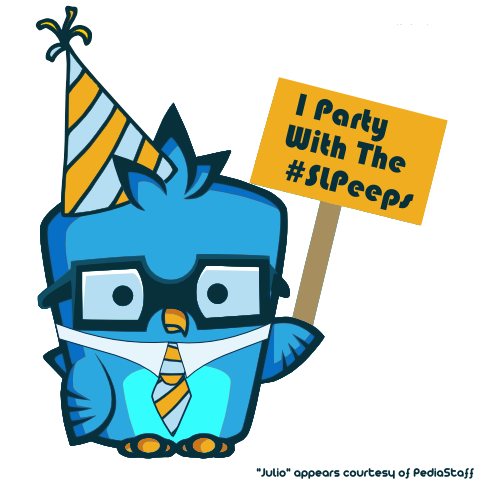 Best twitter hashtag: I admit that I personally use this hahstag more than any other but I am overwhelmed by the amount of growth and the quality of sharing through the #slpeeps tag. I especially love that the #slpeeps tag is used by many who are not SLPs to connect with SLPs or share multidisciplinary information and collaborate. Best unconference: Unplug’d was an ‘off the grid’ summit of Canadian educators who put a great deal of thought into their individual ideas and experiences, answering the question “Why ____ Matters”. They then spent a week in Algonquin park together to share those ideas and experiences. Together, these educators are publishing their collaborative work and are sharing it at conferences across Canada to effect change and growth in education. Best student blog: I have loved Becoming Olivia SLP since the first post. This youtube/blog combo has melded to create a vlog that is fantastically produced and creatively written by first year UWO graduate student, Olivia Hazledon. As she vlogs her journey to becoming a SLP, her audience can learn more about getting into SLP grad school, what SLPs learn about and do in their profession, or relive their own grad school journey along with her. This is my favourite blog right now, hands down. Best educational use of social network: I’m not a teacher, although I do a little teaching, but I thoroughly enjoyed lurking on the 31 Day Game both times that it ran this year. Ben Hazzard and Rodd Lucier organized and created a game/chat/blog to help teachers learn new teaching strategies through sharing them and voting on them in a sort of round robin of teaching strategies. At the end, the participants have fleshed out the supreme strategy but have also learned many other creative techniques along the way. Brilliant. Best educational use of audio / video / visual / podcast: Edceptional podcast/blog by Patrick Black, Deb Truskey and Anne Truger. I enjoy how it continues to be education-based and relevant but how they often cross pollinate teachers with other professionals working in education and promote a multi-disciplinary approach to education. Best ed tech resource sharing blog: Therapyapp411.com is a fantastic blog that allows a platform for SLPs, OTs, and other professionals to share reviews on apps and suggest how they are using these apps in therapy and assessment. Created and maintained by Jeremy Legaspi, Renena Joy, Deb Taylor Tomakaros, and Sean Sweeney, it has a wealth of information and hits all the points that a professional needs to know to decide if they would find the app useful in their practice. It’s open to others to submit reviews which allows for many different view points as apps fight to become established tools in therapy and assessment. Lifetime achievement: I’m probably not allowed to do this, but I want to nominate two people who are, I believe, inextricably linked. Rodd Lucier and Ben Hazzard have participated in a host of activities to help educators learn, share, and grow. In fact, together they have dreamed up and then put into action many ideas. I recognize that they rarely do these things all by themselves, the scope of their ideas require great time and effort from multiple people. I don’t want to exclude the many people who have also worked hard on projects with them but I see them as the creators of many great educational events. From TEDXOntarioEd, to the 31 Day Game, to Unplug’d (to name some of their collaborative accomplishments), these two have become a force to be reckoned with in the educational sector.